You can store music directly on your Apple Watch and then have the Watch stream that audio to other devices. With a few taps you can be playing your Watch's music on AirPods and Bluetooth speakers —but not the HomePod or any other AirPlay devices. What's probably happening is that using AirPlay would drain your Apple Watch's battery so it simply isn't allowed. That's disappointing but it's understandable. What is far less understandable and hugely more aggravatingly confusing is that it's as if Apple doesn't want to admit that you can't AirPlay from your Watch. So the button you press to send music from the Watch to another device has the AirPlay icon on it. 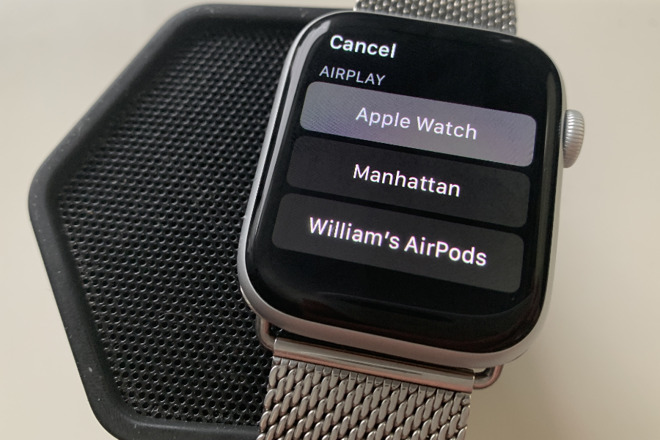 When you tap it, your Watch shows you all the nearby speakers it can connect to —and the list is headed with the word 'AirPlay'. Or rather it is if you swipe up from the bottom of your Watch face and use the Control Center. If, instead, you go to the Settings app, you can choose speakers there but in this case the same list is headed 'Bluetooth'. The same list. Then just to make us sound like the kind of people who write complaint letters in green ink, if you are using AirPlay to send music from, say, your iPhone, then you can control it via your Apple Watch. Obviously. Usually Apple's aim of making everything 'just work' only relies on you buying Apple gear. In this one case, it's like you need to buy many Apple devices but also only use them in very specific ways. So here's how to send audio from your Watch to what other devices you can. Then here's what few other sources of audio you can play via your Watch. And then let us have a wish list of what alterations Apple could make for watchOS 6 that would let us keep what hair we have left. The quickest way to send audio from your Watch to something else is to start by playing it. Unlike with any other Apple device, pressing Play on the Apple Watch's Music app will not start anything playing. It will not disturb the people around you. Instead, it will automatically bring up the Watch's screen for choosing where you want the audio to play. The default, if you have them is your pair of AirPods but when you get to this screen from playing music, there will also be a Connect a Device button. Tap that and if your Bluetooth speaker or other headphones are nearby, then they will be listed and you can tap once more to select them. They just won't be listed if they are AirPlay speakers such as the HomePod. Apple is successfully blurring the lines between what you stream from Apple Music and what you previously bought in iTunes. However, the method we described for downloading Apple Music works with iTunes too. So you can load up your Watch with as much music as you can fit on it without thinking about where it comes from. There are complete alternatives, though, such as using Spotify or Pandora. With either, you can add their iPhone apps and get a companion one for the Apple Watch. On your iPhone, open the Apple Watch app and go to the My Watch section. Scroll down and if Spotify or Pandora are on your iPhone, there will be an option to Install them on your Watch. With Spotify, though, you are really just controlling your iPhone, you're not playing music on the Watch. On the other hand, Pandora has introduced the ability to download music to the Watch. You have to be a Premium subscriber and Pandora is only available in continental USA. However, when you have it, you can create a playlist that's saved on your Watch. The obvious benefit of doing this with a playlist is that you can play that as you go for a run and leave your iPhone at home. If that's what you want to do, though, Apple Music goes a step further. On your iPhone, open the Apple Watch app again and go back to My Watch. Scroll down to Workout, then on the list of options that appears, scroll down once more to the final one, Workout Playlist. If you tap on that, you get a list of all the playlists on your Apple Music account if you have one or iTunes Music if you don't. Tap on one and from now on every time you start a workout, that playlist will begin too. To stop that, go back to the list and tap on None. 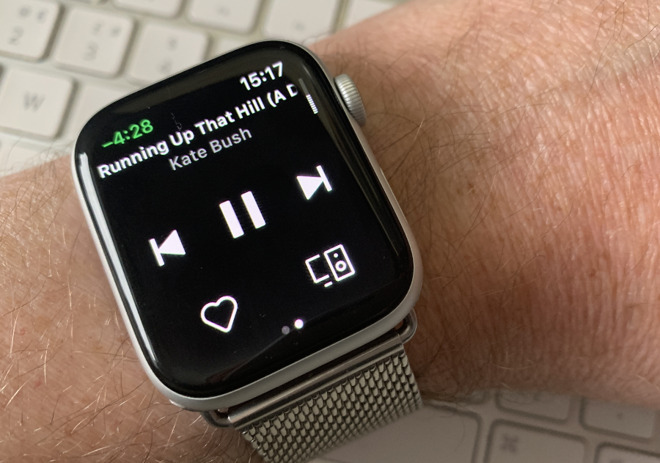 That Workout Playlist feature is currently just about the closest you can get to automation on Apple Watch. It's not as if we expect the Apple Watch to have the capabilities of a Mac or an iPhone, but still both it and the HomePod are more limited than you'd imagine. 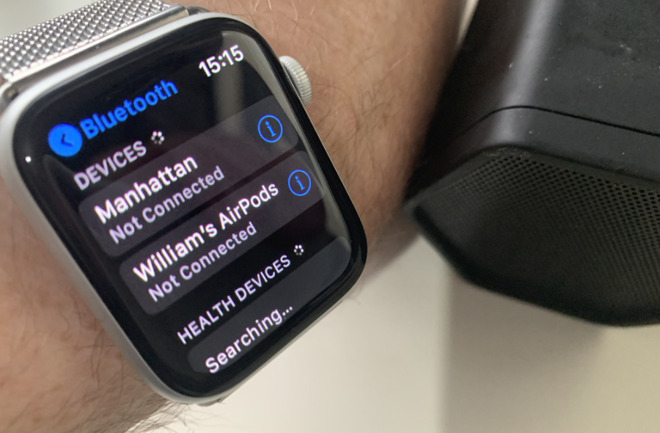 It would be great to avoid the fiddling with external speakers and just have the Watch know that you're at work so you want to use your AirPods. Or that you're at home so you want to use your Bluetooth speakers. What you can do is initiate automated routines from the Watch. You can say "Hey, Siri, turn the office heater on" and if that device is HomeKit-compatible and on your Wi-Fi network, it works. Even if your devices are not compatible with HomeKit, if you can install Homebridge on a Mac that's on the network and always awake, then you can have Siri control many more devices from your Watch or anywhere. We'd just like to be able to set a Siri Shortcut so that when we tell our Watches, it will load up BBC Radio 4 and send it to our HomePod. As it is, you're as likely to find Homebridge too fiddly as you are to find it useful, though, and Apple is fixated on stopping you have to fiddle. Or at least it usually is. With music on the Apple Watch, though, it is shocking how inconsistent and confusing the feature is. It's easy to complain that Apple shouldn't be confusing when actually it is incredibly hard to make something simple. Yet this time it seems so unnecessarily confusing.